Organiser: Neelanjana Sengupta. Chair: David J. Wales. REGISTRATION: please complete the registration form at this link and email the completed form to Bogmallo Beach Resort at resvn@bogmallobeachresort.com. Or telephone +91 832 7131242/7131243. Energy Landscapes workshops focus on how emergent properties of complex systems can be predicted and understood from underlying features of the potential energy surface. Participants are expected from a wide range of theoretical and experimental perspectives, including atomic and molecular clusters, biomolecules, glasses, machine learning, and soft and condensed matter. Contributions from chemistry, physics, mathematics, coputer science and biology are welcome. Following the very successful meeting on Porquerolles Island in 2016, the next meeting will be in Goa, India, at the Bogmallo Beach Resort (winners of 2014 best beach resort award from Safari India South East Asia Travel). Single occupancy room: INR 5300 or GBP 58 (approx). Double occupancy room: INR 6500 or GBP 72 (approx). This includes all taxes, and breakfast, lunch, dinner, airport pickk up and drop, welcome drink, use of swimming pool and gymnasium. The meeting will run from 13th to 17th August 2017. We are very pleased to acknowledge sponsorship from Dascena Scientific Consulting and ACS Omega. 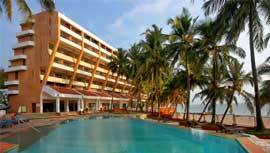 Pickup from Goa airport and transfer to Bogmallo Beach Resort. 10:15 AM - 11:00 AM Konstantin Roeder: Multifunnel Energy Landscapes of Biomolecules - A Route Towards Understanding Disease and Misfolding? 11:30 AM - 12:15 PM Biman Bagchi: Anomalous dimensionality dependence of diffusion in a rugged energy landscape : How pathological is one dimension? 13:30 PM - 21:00 PM Tour No.1. South Goa bus tour, including the cruise on Mandavi river. Dinner around 18.00 PM on the tour. Or, return earlier, and dinner at the hotel. 13:30 PM - 18:30 PM: Tour No. 2. North Goa bus tour, mainly visiting the famous Goa beaches. 19:00 PM: Dinner in the hotel. Pick up from Bogmallo Beach Resort and transfer Goa airport and station.